Preheat the oven to 450 degrees Fahrenheit. Line a baking sheet with aluminum foil. Cut slits three-quarters of the way through a baguette about 1-inch apart, making sure not to cut all the way through the baguette. In a bowl, mix together the butter, jalapeno, garlic and salt. In a separate bowl, mix together the cheeses. Spread a little of the butter mixture into each of the slits, and press the cheese mixture into the slits, using all the cheese and butter and filling all the slits. Put the baguette onto the baking sheet lined with foil and place in the oven. Bake for 10 to 15 minutes, or until the cheese is bubbling and the baguette is golden brown. What we can pair this bread with for dinner? It goes great with any pasta…like https://patijinich.com/recipe/spicy-clam-chorizo-pasta/ Or you can eat it with your favorite chicken or meat dish…or a salad…the possibilities are endless! My husband loved this! 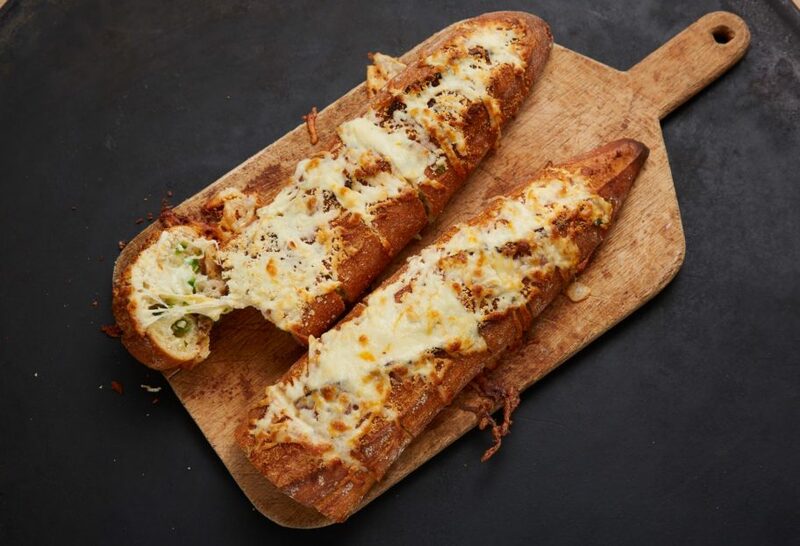 So much cheese and oh so deliciously gooey. He likes things spicy so I added an extra jalapeño and it was perfect! The whole baguette was eaten up before dinner even made it onto the table. I’m so happy you guys love it, Jacquie. We love all of your recipes. My wife and drool while watching you prepare your beautiful meals. We appreciate you sharing your recipes with us. We look forward to trying to prepare some of your meals for our friends and us to enjoy. Thank you again. Thank you both for tuning in! Hahaha ok, I’ll try to put up a video soon, Eric. They are, finally, showing your latest show on Baja. I watched your show last night and the jalapeno garlic bread did it for me. The little neck clams with spaghetti; a different twist. As a child, my family and me always went clamming (As you know, Rhode Island has the best little necks). From, Silicon Valley, a big and faithful fan. Oh clamming must have been so much fun in Rhode Island, Rosanna. Enjoy the rest of the new season!